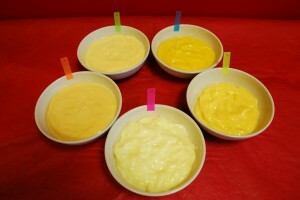 For this experiment, I prepared five different types of custards. One was made from scratch, two were canned (Irresistible’s and President’s Choice brands) and two were prepared from powder (Bird’s and Horne’s). 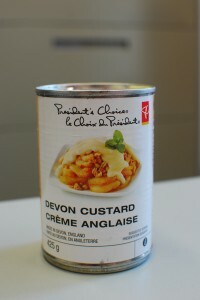 I must say, I am intrigued by all the different forms of custard on the market. Canned and powdered? Why even bother making it from scratch? Put the powder in a container and fill it up to 425 mL. Whisk the contents together until it thickens. What a fabulous product. You literally just add water! This literally took 5 seconds to make (once I added the boiling water). I am hoping against all odds that this one comes out on top, because how great would it be to have custard ready in 5 seconds? 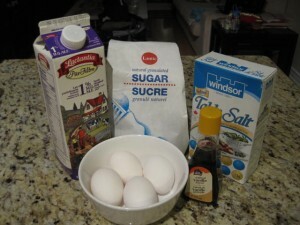 Dissolve sugar in milk and heat to a boil before adding the custard powder. Boil the mixture for an additional minute until the custard thickens. There is problem with these instructions. Anyone who has cooked with milk knows that you can’t ‘boil’ it as this would result in curdling and possible burning of the proteins in milk. So I modified the instructions slightly and simmered the milk while dissolving the sugar, and then added the custard powder/milk solution into the warm milk/sugar mixture while increasing the temperature. I had to constantly stir the mixture to make sure that the milk didn’t burn to the bottom of the pot.This powdered custard was a little more involved compared to Bird’s. However, I noticed that the appearance was less gummy and more silky in texture. However, they both tasted thick and gummy. 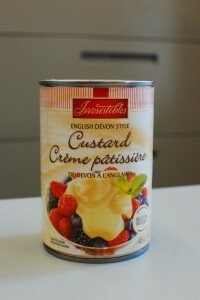 The two canned custards are self-explanatory – they’re already made. Just open the can and you’re ready to go. Yay! In a saucepan, stir together the sugar, cornstarch and salt. Gradually stir in milk, keeping smooth. In a cup or small mixing bowl, beat eggs slightly. Stir vigorously into milk mixture. Cook over medium heat, stirring constantly, until mixture comes to a boil. Boil for one minute. Stir in vanilla. Chill. This one is obviously the most involved. Although the ingredients are simple, there are detailed steps that have to be followed in order for the end product to turn out properly. For instance, you have to heat up the milk first, then temper the egg yolks into the mixture. Return the mixture over medium heat and stir constantly until the mixture thickens. Or you can do what my baking assistant did – which was throw everything into a pot and hope for the best. (Good thing she’s a pro at this.) However, this one still takes the longest to make and is still the most technical/labour intensive out of all the kinds of custards being tested. Although I appreciate the ease of the canned custards, I’d still prefer to use one of the powders because it doesn’t take that much effort and I think you get a better tasting product. 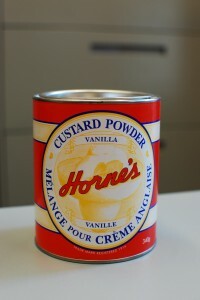 I’m not a fan of canned custards from a taste or appearance standpoint nor do I think it’s worth the hassle to make custard from scratch. 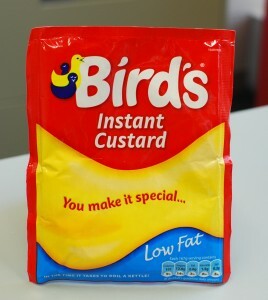 Of the powdered custards, I’m hoping that Bird’s will come out as the favourite (the one where you just add water). Even though it tends to come out quite gummy and thick, you can always modify the texture by adding more liquid. Wouldn’t it be nice to know that there are still some things that really are that simple?